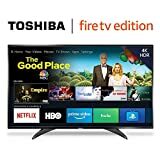 People pretty much lost their minds when Toshiba and Amazon launched special versions of the LF621U19 4K TV earlier this year. This is an outstanding television with a great design and a beautiful screen, and it has Fire TV built right in! It’s perfect for cord cutters of course, but also for anyone who wants the best media streaming experience without having to buy a separate box. But the real kicker was the pricing, with a 50-inch version available for just $400 and a 55-inch model that costs $500. If you thought those prices were good, prepare to be blown away because Amazon is running a huge sale right now. 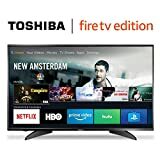 the 55-inch Toshiba 4K Fire TV is on sale for $429.99 right now, the 50-inch model is only $349.99, and the 43-inch TV is on sale for just $299.99!